KATMANDU, Nepal â€“ U.S. Peace Corps volunteers have returned to Nepal eight years after they left due to a communist insurgency. The U.S. Embassy in Katmandu said 20 Peace Corps Volunteers arrived in the country on Sunday. They will be working on food security, sanitation and health projects in different locations in this Himalayan nation. The Peace Corps withdrew volunteers from Nepal in 2004 citing security concerns as Maoist rebels fought government troops. The Maoists joined the peace process in 2006 and gave up their armed revolt. The Maoists' deputy leader Baburam Bhattarai now leads a coalition government. The U.S. announced last week it was removing the Maoists from its list of terrorist groups. Maoists now will be in charge of the countryâ€™s internal security. 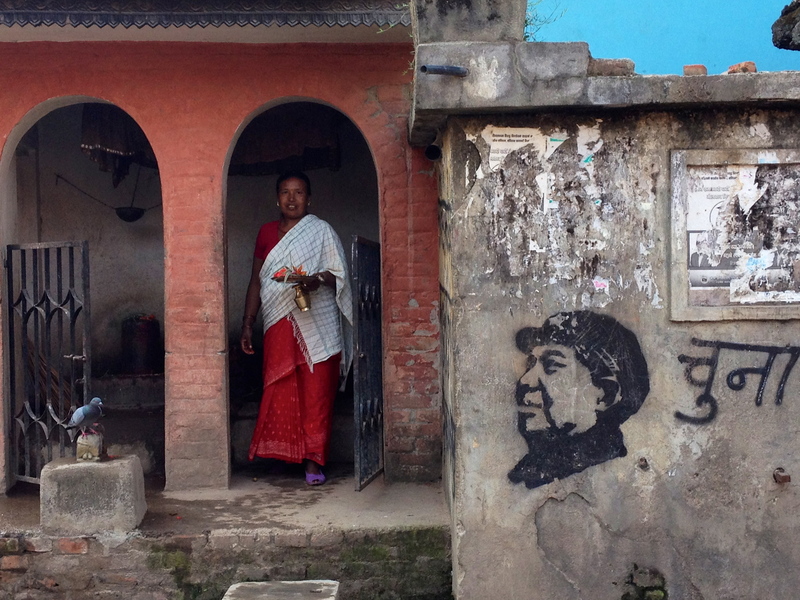 The appointment is the result of a secret deal between Communist PM Khanal and Maoist leaders. The party representing the former guerrilla fighters also controls 19,000 armed men. POPPY FIELDS FOREVER: Police destroying an opium poppy field in Bishrampur of Parsa last month. Despite token action like this, opium and cannabis cultivation would not be possible without police and political protection. The parallels with Afghanistan are already frightening in the Nepal Tarai: criminality, impunity, the absence of the state, corruption and militancy. Acres upon acres of white poppy flowers now complete the picture. Just as in Afghanistan, it is difficult to tell the difference between political militancy, criminality and terrorism. Police estimate that up to 2500 bighas (4175 acres) of farms in Bara and Parsa are growing poppies. That is enough to produce 30,000 kg of opium, which can be refined into 3.5 tons of heroin. Officials estimate that Nepal is now exporting nearly Rs 3 billion worth of opium. "This is exactly what happened in Afghanistan," explains police superintendent Devendra Subedi, who was an adviser for the UN in Afghanistan till 2007. "There is political instability, law and order have collapsed, there is no investment. We are on the same path." International trafficking rings dealing in opium are settling in India to take advantage of the legal provision there permitting opium production for medicinal purposes. â€œThe dynamics in India is easily reflected in Nepal due to proximity and the open border,â€� said DIG Malla. â€œSuch a possibility cannot be ruled out,â€� said Deputy Superintendent of Police (DSP) Diwas Udas, who has decade-long experience working with NCLEU. UNDOCÂ´s inspection team had pointed out the need for improving law and order in the affected zones through political commitment to curbing the escalating cultivation of opium, said Under-Secretary Dahal. 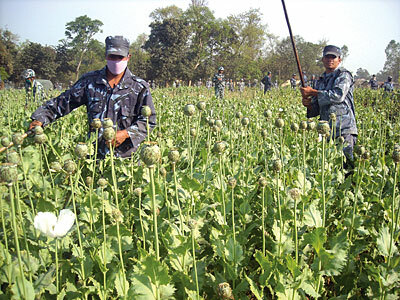 Police destroy Maoist opium crop Nepal. A major source of funding for the Maoists, say Singh and Diwan in the South Asia Intelligence Review of the South Asia Terrorism Portal, is poppy or opium cultivation. Portions of Jharkhand and Bihar are reported to be the principal pockets of poppy cultivation exploited by the Maoists. Opium fields are screened and hidden behind peripheral maize cultivation. The Union Finance Ministry in its annual report for 2009-10, released in March 2010, said that the Central Bureau of Narcotics destroyed at least 1,443 hectares in 2009 alone. How much do the Maoists make from such cultivation? The illicit crops destroyed two districts alone in the state of West Bengal were estimated to have a value of over 12 billion rupees, if diverted to drug cartels for the manufacture of heroin. In India, opium is cultivated under strict licensing in select pockets of three states â€“ Rajasthan, Madhya Pradesh and Uttar Pradesh. The entire opium crop is bought by the government and processed in public sector factories for their further use in pharmaceutical industries. In conversation with Biplob Ghosal of Zeenews.com, former military intelligence officer and ex-Research and Analysis Wing (RAW) officer, RSN Singh cautions India about the challenge that emanates from its own soil, i.e., the violence-infested threat from Maoists. Singh also gives a detailed view of the foreign connection to the insurgency. 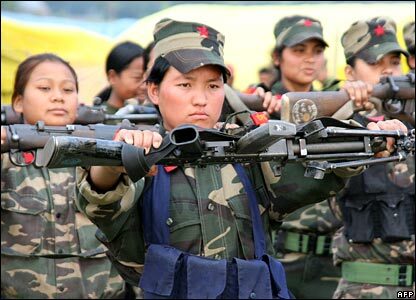 Biplob: What about the foreign aid to Maoists? India is concerned about aid possibly coming to Indian Maoists from Nepal and China. Singh: Earlier when people said there is direct involvement of China in assisting Maoists, nobody believed it and said there was no proof, but now there is ample proof. There are Maoist leaders who are going to Yunan province of China for training and arms and ammunitions. In Myanmarâ€™s Kachin province, China have provided a weapon manufacturing facility, which produces replica of AK 47 rifles, which are supplied to the Maoists. There is a collusion between Maoists, insurgents of the northeast and Lashkar-e-Toiba (LeT) and as time passes, these linkages will go stronger and therefore we have a huge internal security problem at hand. There are Europe based organisations which are funding them - same organisations which were funding in Nepal and The Coordination Committee of Maoist Parties and Organizations of South Asia (CCOMPOSA) is also financially assisting them. Maoists have linkages with the Dawood gang as well. Not only this, Maoists have also got into drug racket. They have even been forcing people to cultivate opium. So it is a huge nexus which is emerging. As far as China is concerned, letâ€™s not forget the example of Nepal. When Nepalâ€™s arms resurrection by the Maoists was at its peak, Chinese authorities kept saying they had nothing to do with it. However, after Prachanda came to power, he was invited to Beijing Olympics. Following this, there were flurry of official and unofficial visits of Chinese delegates to Nepal. â€œTodayâ€™s delisting does not seek to overlook or forget the partyâ€™s violent past, but rather looks ahead towards the partyâ€™s continued engagement in a peaceful, democratic political dialogue in Nepal,â€� the statement said. The removal of the designations releases the groupâ€™s blocked property and assets in the U.S., and American entities can do business with it without obtaining a license to do so. January 11, 2012: Even as China continues to harass India on security and diplomat issues, the Indian intelligence agencies have come up with far more disturbing reports which have huge implications for Indiaâ€™s national security. These classified reports reveal that Maoist leaders have been secretly visiting Chinaâ€™s Yunan province for arms training and China has set up a weapon manufacturing facility in Myanmarâ€™s Kachin province. The Kachin factory produces near-exact replicas of AK 47 rifles which are supplied to the Maoists. The Indian government has long been aware that the Maoists are equipped with sophisticated weaponry, and now the source is known. Even more dangerous is the growing proximity of the Maoists with Pakistan based Islamic terror group Lashkar-i-Taiba and terrorist leader Dawood Ibrahim. The Indian Maoists have also cooperated with Islamic terrorist run, drug operations. Several Indian states report that Maoists are pressuring local farmers to grow poppy (for opium and heroin) on their farms. Maoists now talk of working with Islamic terrorists (who want to make Kashmir part of Pakistan), Kashmiri separatists, and Islamic radical groups determined to make India a Moslem state. The Maoists seek to make India a communist dictatorship and are willing to work with other anti-Indian groups, even if those groups have goals that ultimately clash with those of the Maoists. The Maoists have declared their goal of overthrowing the government in New Delhi in two decades, though these plans are mere day dreams, given the fact that the Maoists have of late lost several key leaders. The Indian government has declared Left Wing Extremism, another name for Maoists, as the single biggest internal security challenge for India. Kathmandu: For the first time, Nepal Army and the US military, will conduct joint humanitarian assistance operations next week in Pokhara. 'Operation Pacific Angel Nepal' is a six-day project that will include medical, optometry, and construction programmes as well as various subject-matter expert exchanges, a US Embassy statement said. The exercise will commence from September 10 in Pokhara and will be led by the United States Pacific Air Forces. Around 150 Nepali and US military personnel along with Project HOPE doctors, local non-governmental organisations and military doctors from Australia and Mongolia, will support this operation to help improve the health and quality of life for Nepali communities and enhance regional cooperation, stability and security, the statement said. This is the first time Operation Pacific Angel is being conducted in Nepal. This year, Pacific Angel has also been conducted in Laos, Vietnam, and the Philippines. The Air Accidents Investigation Branch said it was sending two staff to Kathmandu to assist local authorities looking into the accident, which killed all 19 passengers shortly after takeoff from Kathmandu airport. The Britons, who were on a trekking holiday, were among those killed after the twin-engine propeller Dornier plane crashed in a field. Initial reports suggested the plane had possibly hit a large bird but pilot error or a malfunction are now being investigated. Ratish Chandra Suman, an official from Tribhuvan international airport, said the pilot had reported trouble two minutes after takeoff and appeared to have been trying to turn back to the airport. The plane crashed on the bank of the Manohara river at 6.18am on Friday in clear weather and witnesses said the plane was already on fire before it hit the ground. Tributes were paid to the group of Britons, who included the lawyer Ben Ogden, 27, from Buckingham, an Oxford University graduate who worked for the international law firm Allen & Overy. He was on the Everest Base Camp trip to celebrate just having qualified. The firm said the young lawyer, who lived in London, "had an incredibly promising career ahead of him". The Britons, named by the local travel company Sherpa Adventures, also included Timothy Oakes, 57, a married father and secondary school adviser for Lancashire county council. He loved mountaineering and was on the trip of a lifetime with an old school friend, his distraught wife, Angie Gaunt, said at the family home in Winwick, Cheshire. She added: "He was going because he always wanted to see Everest. If you love the mountains, it is the ultimate." The US embassy in Kathmandu is buzzing with activity these days. Not that it remains quiet usually, but seven mails in my inbox from the embassy in six days indicate things are busier than routine. Though Nepalâ€™s two big neighbours China and India remain in focus for their engagement with Kathmandu, countries of the European Union and US too enjoy significant leverage in the Himalayan nation because of their funding and investment potential. On Monday US Assistant Secretary for South and Central Asian Affairs Robert O Blake landed at Tribhuwan International Airport on a two-day visit. It is the first visit by a high-level US official to Nepal since dissolution of the Constituent Assembly in May. Blake got busy in meetings with political leaders from various parties soon after landing. Meetings with President Ram Baran Yadav, Prime Minister Baburam Bhattarai and newly appointed Nepal Army chief General Gaurav SJB Rana are also on the agenda. He will also interact with business leaders, human rights activists, civil society leaders, representatives from the Tibetan community in Nepal and address a press conference before departing on Tuesday evening. Besides bilateral issues, Blake is concerned at a recent ordinance sent by the Maoist-led government to President Yadav that many fear could grant blanket amnesty to those who committed serious human rights violations during the civil war. Recent closure of Kathmandu outlets of Pizza Hut and KFC due to labour unrest and the ongoing political and constitution crisis in Nepal following dissolution of CA without a constitution also figured in the meetings. In most of his engagements, Blake was accompanied by newly appointed US ambassador to Nepal Peter W Bodde who reached Kathmandu on Saturday and submitted his credentials to the President on Monday. He replaces Scott H DeLisi who left in July. Bodde who was posted in Baghdad prior to the new assignment has already served in Kathmandu twice (1982-84 and 1994-97). A Foreign Service veteran, he speaks Nepali fluently, something which is expected to help him abundantly while discharging his duties. Both Bodde and Blake arrived in Kathmandu within three days of US removing the ruling Maoist party from its list of terrorist organizations. Washingtonâ€™s move came six years after the Maoists signed a peace deal that ended the civil war and entered political mainstream. Amid these developments, 20 Peace Corps volunteers also arrived in Kathmandu on Sunday. They are the first batch of volunteers from the US government agency focused on peace and friendship to Nepal since 2004 when they left at the height of civil war. The fresh batch of volunteers will receive training for 12 weeks before they are assigned to three districts in the west where they will work on food security, sanitation and health projects. Itâ€™s been 50 years since Peace Corps volunteers started arriving in Nepal and till date over 4,200 of them have served in the country. Thereâ€™s more. From Monday Nepal Army and the US military, led by the US Pacific Air Forces started a six-day humanitarian assistance project called â€˜Operations Pacific Angel Nepalâ€™ in Pokhara, a scenic lakeside town frequented by tourists. Nearly 150 Nepali and US military personnel and Project HOPE doctors are involved in the project that will include medical, optometry and construction programmes and also subject-matter exchanges between experts. An US embassy release says the project would help improve health and quality of life of Nepali communities and enhance regional cooperation, stability and security. Though the US military has been conducting Operation Pacific Angel throughout the Asia-Pacific region since 2007, this is the first time it is being held in Nepal. For those interested, diplomatic relations between Nepal and US began in 1947 and Washington set up its embassy in Kathmandu in 1959. Since 1951, US has provided $ 1.2 billion in developmental assistance to Nepal. In recent years that assistance has averaged $ 54 million annually. Despite the downpour of rain, over 300 Nepal Army, U.S. military and local community residents attended the closing ceremony of OPERATION PACIFIC ANGEL at Machhapuchhre Higher Secondary School in Kaski District, Pokhara yesterday. Officiating over the ceremony was Nepal Army Chief of Staff Lieutenant General Nepal Bhusan Chand, Western Division Commander Major General Victor, and on behalf of the Commander of the U.S. Pacific Air Forces, Major General Russell J. Handy, Director of Operations, Plans, Requirements and Programs, Joint Base Pearl Harbor-Hickam, Hawaii. â€œWe are honored to have worked alongside the Nepal Army through our Pacific Angel program, and deeply appreciate the hospitality our Nepali hosts have extended to us,â€� said Handy. â€œThroughout this past week, we have been continually impressed with the professionalism of the Nepal Army, and applaud the Nepal Army and the Ministry of Home Affairs for their diligent efforts to improve the quality of life of Nepalâ€™s citizens,â€� he added. Why do Nepal's former rebels want to join the army? Nepalese soldiers have moved into camps where thousands of former Maoist rebels have lived for more than five years. The former rebels have now come under control of the army in what is seen as a key step to securing peace six years after the end of Nepal's civil war. About 9,000 former fighters have been confined to camps since 2006, awaiting a political settlement. About 6,000 of them are to be integrated into the army. The remainder will get a financial settlement. 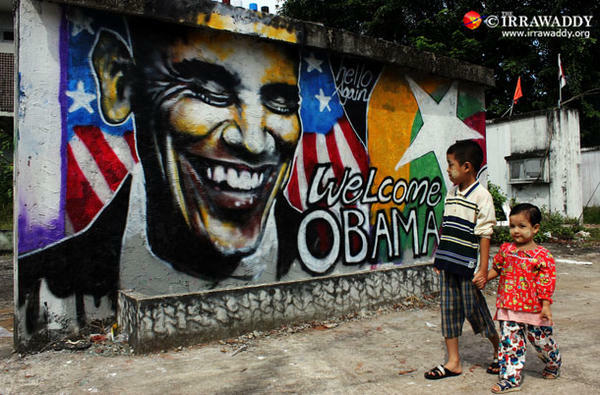 "Pic: Twitter users creeped out by Obama mural in Burma"
Oh, that's right, only Americans need free speech stifled. RANGOON, Burma â€” For 15 years, Aung San Suu Kyi waited in her lakeside villa, confined to the small plot of land under house arrest, dreaming of her return to the world. The gates, topped with barbed wire, swung open and a black presidential limousine pulled into the driveway. Out stepped President Obama, pressing his hands together and bowing ever so slightly â€” a gesture the Burmese democracy leader, dressed in a green scarf, peach blouse and black sarong, returned. The leaders of the free world had come with a message of hope for 60 million Burmese, but it was this bow and this hug, with this one resident, that symbolized the most â€” a scene almost unimaginable just two years ago when Suu Kyi, a Nobel peace laureate, was still a prisoner in her own home and Burma was ruled by a repressive military junta. Released in 2010, she is now a member of parliament, and she visited Obama at the White House in September. After meeting with President Thein Sein, the civilian leader who took control of the country from the junta, Obama for the first time referred to the country as â€œMyanmar,â€� the name used by the nationâ€™s own leaders. The U.S. governmentâ€™s policy has been to continue using â€œBurmaâ€� â€” the English name based on the Burmese colloquial word for the country and the one used by the opposition when speaking English. A year after brutally crushing pro-democracy demonstrations, the junta changed the name of the country in English from the Socialist Republic of the Union of Burma to the Union of Myanmar in 1989. Gary Lewis, UNODC representative in South East Asia: "There is indeed no quick fix"
Opium growing has increased in Burma for a sixth year running despite eradication efforts, a UN report says. The UN Office on Drugs and Crime said land used for opium had risen by 17% this year, from nearly 40,000 hectares (100,000 acres) to 51,000 hectares. Burma is the second largest opium grower in the world after Afghanistan. Most of Burma's opium is refined into heroin - about half goes to meet the growing market in China, with the rest being sold across South East Asia. The Communist Party of Burma ; CPB) is the oldest existing political party in Burma. The party is unrecognised by the Burmese authorities, rendering it illegal; so it operates in a clandestine manner, often associating with insurgent armies along the border of People's Republic of China. 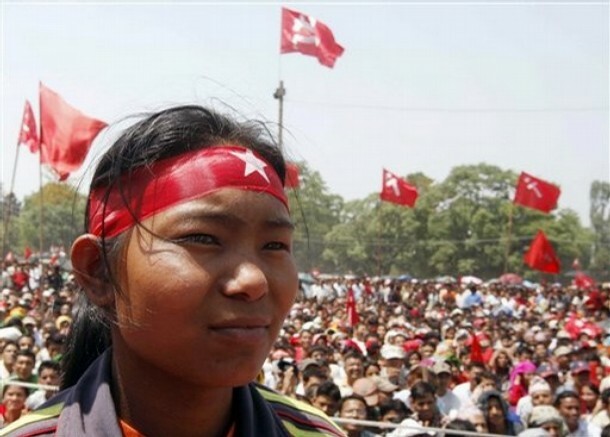 It is often referred to as the Burma Communist Party (BCP) by both the Burmese government and the foreign media. Is there a place left on earth where this country hasn't had some kind of military intervention? "In the past, many journalists would enter Myanmar [Burma] with tourist visas, so if [government officials] made the mistake of talking with journalists, they would lose their job. That is why they are very careful, and sometimes very reluctant, to talk with foreign journalists," he explained. Another unknown was whether the country's new media censorship guidelines â€“ released in August last year â€“ would also apply to foreign journalists living and working in Burma, said Phil Robertson, of Human Rights Watch. They include regulations that "the state, and economic policies of the state, will not be negatively criticised", among others. Local and foreign journalists reporting about Burma may also have been the target of a recent mass email hack by "state-sponsored attackers", although it is not yet clear who or where those attackers may be. The email hacks follow a series of cyberattacks on various Burmese media outlets, including weekly journal The Voice and the Eleven media group, although the government's own website was also targeted three times last week, the Myanmar Times reported.
" Drug money is funding the rebels and terrorists. The Sahara has become a transit point not just for hashish but also for some of the Latin American cocaine and Afghan heroin destined for Europe. " The boss of Google has urged Burma's government to allow private businesses to develop the country's poor telecommunications infrastructure, emphasising the importance of competition and free speech. "Try to keep the government out of regulating the internet," Eric Schmidt said to a round of applause from a group of students at a technical university in Rangoon. "The answer to bad speech is more speech. More communication. More voices," he said. "If you are a political leader you get a much better idea of what your citizens are thinking about." Schmidt said the internet could help cement political and economic opening in Burma, which has undergone rapid changes since the reformist president Thein Sein took office in 2010 after decades of direct military rule. "The internet will make it impossible to go back," he said. "The internet, once in place, guarantees communication and empowerment becomes the law and practice of your country." Schmidt's visit to Burma comes after trips to Libya, Afghanistan and North Korea, which he said was a "truly wacky place". USAid recently sponsored a delegation of executives from Cisco Systems, Google, HP, Intel and Microsoft to Burma. This month Cisco said it planned to establish two state-of-the-art network training centres in Burma. President Thein Sein will make a state visit to the US in the near future, the first such trip in 47 years, according to reports. Burmese state television announced on Monday that Barack Obama had issued an invitation to the president. No exact date was announced. The last Burmese leader to visit the White House was the dictator Ne Win in 1966. The US has been a prime mover in urging Thein Sein to introduce reforms after five decades of repressive military rule that ended when he became an elected head of state in 2011. The US applied sanctions against the previous military regime, but the Obama administration has shifted its policy to engagement, gradually lifting most sanctions after reforms. In November, Obama became the first serving US president to visit Burma. This extraordinary feature explores US and Thai involvement in a new international drug war. This extraordinary feature explores US and Thai involvement in a new international drug war. "You've got Burmese troops actually guarding the plants, military intelligence providing escorts for the trafficking caravans." The US State Dept says drugs account for nearly 50% of Burma's foreign exchange. The Shan State Army is a Burmese rebel group fighting for independence. Deep inside Burma smartly dressed in crisp new uniforms the Shan proudly parade their revitalized troops Though the Shan used to be drug producers they have now joined the war against drugs in return for international assistance. US Admiral Blair describes the assistance the US has channelled through Thailand for the new anti-drug army; "We've provided training teams, upgraded equipment and increased intelligence sharing". But with China backing the Burmese this drugs conflict is rapidly becoming something much larger. Says renown Burma watcher Bertil Lintner, "you've got the Burmese army backed by the Chinese and the Shan by the Thais and Americans -- it's not far fetched to believe things could go awfully wrong if not handled carefully". NEW DELHI (AP) -- Indian officials reacted with outrage Sunday to an audacious attack by about 200 suspected Maoist rebels who killed 24 people by setting off a bomb and firing on a convoy carrying ruling party leaders and members in an insurgency-wracked state. appeared to be a warning to officials to stay away from the rebels' main base of support. Prime Minister Manmohan Singh and party President Sonia Gandhi visited some of the 37 people who were injured in the attack in a hospital Sunday in the Chhattisgarh state capital and said the government would take firm action against the perpetrators. "We are devastated," said Gandhi, who denounced what she called a "dastardly attack" on the country's democratic values. Rajnath Singh, president of the opposition Hindu nationalist Bharatiya Janata Party, said the country should unite in its fight against the Maoist insurgency. The convoy was attacked in a densely forested area about 345 kilometers (215 miles) south of Raipur, Chhattisgarh's capital, as the Congress members were returning from a party rally. Four state party leaders and eight police officers were among the 24 people who were killed. Other victims were party supporters. However, Gill said the state government was incapable of devising a strategy to tackle the Maoist threat. "They don't have the political will and bureaucratic and police set-up to prevent such attacks," he said. He said the state government had ignored the need for special forces to tackle the threat. "Most of the special forces in the state are being used for non-operational duties like guarding state politicians," he said. Prime Minister Singh has called the rebels India's biggest internal security threat. They are now present in 20 of India's 28 states and have thousands of fighters, according to the Home Ministry. The rebels, known as Naxalites, have been fighting the central government for more than four decades, demanding land and jobs for tenant farmers and the poor. They take their name from the West Bengal village of Naxalbari where the movement began in 1967. The fighters were inspired by Chinese Communist revolutionary leader Mao Zedong and have drawn support from displaced tribal populations opposed to corporate exploitation and official corruption. Oh they left !!! And those Maoists are so loving ! WASHINGTON, D.C., April 29, 2015 â€“ The Peace Corps today announced that all 32 trainees and 53 volunteers are temporarily leaving Nepal and returning to the United States following the devastating earthquake that hit the country on April 25. The agency will conduct a thorough assessment of volunteersâ€™ sites and conditions throughout the country, including local medical infrastructure, communication systems, transportation and other key support services that are critical to volunteersâ€™ wellbeing in Nepal. Volunteersâ€™ health, safety and security are Peace Corpsâ€™ top priorities. Kathmandu, Nepal: Relief supplies for earthquake victims have been piling up at the airport and in warehouses here because of bureaucratic interference by Nepalese authorities who insist that standard customs inspections and other procedures be followed, even in an emergency, Western government and aid organization officials said Sunday. "The bottleneck was the fact that the bureaucratic procedures were just so heavy," Jamie McGoldrick, the U.N. resident coordinator, said in an interview. "So many layers of government and so many departments involved, so many different line ministries involved. We don't need goods sitting in Kathmandu warehouses. We don't need goods sitting at the airport. We need them up in the affected areas." The U.S. ambassador to Nepal, Peter W. Bodde, said he had spoken to Nepal's prime minister, Sushil Koirala, about the issue and "he assured me that all the red tape will be stopped." [Opium] Planting season is six weeks away, and if you miss that you'll need to deliver food aid for another three months," he said. "The monsoon is coming in eight weeks. So it's very precarious. KATHMANDU: Nepal's communists have said that national security is under threat by some foreign powers in the name of relief distribution and urged Prime Minister Sushil Koirala to take note of this. At an all-party meeting called by Koirala, three senior communist leaders - UCPN (Maoist) chairman Pushpa Kamal Dahal, CPN-Maoist's Mohan Baidhya and Majdoor Kisan Party's Narayan Man Bijukchhe - warned that national security could be at stake. According to the Annapura Post daily, Baidhya and Bijukchhe said in the meeting that India, in the name of relief distribution, is posing serious threat to national security and urged the prime minister that activities of the Indian Army and rescue team should be contained. Dahal said that India's border force is going beyond the control of Nepal government and its activities are not helpful in relief distribution. He also said in the meeting that government should prepare a guideline to accept what kind of foreign aid, assistance in cash and kind should be taken by Nepal. Volunteers - What was time again? Like the other prospectors trying to draw the dregs out of Myanmarâ€™s largest unregulated oil field, Mr. Win Myint Oo, 24, came with a dream of striking oil and making it rich. Nga Naung Mone is one of three oil fields near the town of Minhla, in south central Myanmar, and the largest by far. The others, Dagine and Da Hat Pin, are much smaller and less developed. Now several thousand people live and work here, and the oil fields are chockablock with derricks, many as close as 10 feet apart. The current international narrative on the plight of Myanmar's persecuted Rohingya minority has failed to recognise the roots of the present crisis or the growing transnational jihadist links of Rohingya militants, who have stepped up attacks. Rohingya militants have actually been in the vanguard of the global rise of Islamic radicalism since the early 1940s, when they joined the campaign to press the British to establish Pakistan by partitioning India. It was the British who earlier moved large numbers of Rohingyas from East Bengal to work on rubber and tea plantations in Burma, now Myanmar, which was administered as a province of India until 1937 before it became a separate, self-governing colony. Rohingya migrants settled mainly in Myanmar's East Bengal-bordering Arakan region (now renamed Rakhine state). Britain recruited Rohingya Muslims into its guerrilla force - the so-called V Force - to ambush and kill Japanese troops. When the British eventually regained control of Arakan in 1945, they rewarded Rohingya Muslims for their loyalty by appointing them to the main posts in the local government. Emboldened by the open British support, Rohingya militants set out to settle old scores with Buddhists. Now history has come full circle in 2017, with the Myanmar military being accused of driving Rohingyas out of Rakhine state. But in a development that carries ominous security implications for the region, especially Myanmar, India and Bangladesh, Rakhine is becoming a magnet for the global jihadist movement, with Rohingya radicals increasingly being aided by militant organisations in Pakistan and Saudi Arabia. Against this background, India is legitimately concerned about the illegal entry of over 40,000 Rohingyas since 2012, with the government telling the Supreme Court that their arrival poses a 'serious security threat' because of the links of Rohingya militants with terrorist outfits and the ISI. Some of these militants have become active in India, according to the government. India is already home to some 20 million illegal migrants from Bangladesh. But the Rohingya aliens pose a special challenge because of the escalating jihad in Rakhine and some Rohingyas' militant activities on Indian soil. The establishment media continues to portray the Rohingya Muslims as the victims of â€œBuddhist terror.â€� Reality, as always, is not so simple. â€œAll of our family died at the villageâ€¦ we will not go back,â€� said Chaw Shaw Chaw Thee, one of hundreds of displaced Hindus seeking shelter in the state capital Sittwe. Hindus, who make up less than one percent of Rakhineâ€™s population, accuse Rohingya of massacring them, burning their homes and kidnapping women for marriageâ€¦. â€œWe were barbers for Muslims, our women sold things in Muslim villages, I had Muslim friends, we had no problems,â€� said Kyaw Kyaw Naing, a 34-year-old Hindu who can dance across linguistic divides in Hindi, Rakhine, Burmese and Rohingya. Community ties in what is also Myanmarâ€™s poorest state have now unravelled. This initiative comes in two parts: ?the belt? covers the land routes and ?the road? covers maritime routes, with the aim of improving trade relations through the three regions. China wishes to create ?a new era of globalisation? open to all. China already has 1 trillion of dollars? worth of projects underway in Africa and Asia that were potentially generated through lead network. The China Development Bank had set aside 900 billion in 2015 right before the Belt and Road Summit held in Beijing. Over the long term, China will lend 8 trillion to build infrastructure in 68 countries. ?One Belt, One Road? is to date the most important public good China has given to the world, first proposed by China but for all countries to enjoy,? China?s Foreign minister Wang Yi said. ?The culture and historical genes of One Belt, One Road come from the old Silk Road, so it takes Eurasia as its main region.? Nepal is not Myanmar. Former Burma is now Myanmar. Volunteers in Myanmar work with their communities on projects in English education. During their service in Myanmar, Volunteers learn to speak Burmese. There are currently no Peace Corps Volunteer openings in Myanmar. As a Peace Corps Volunteer in Myanmar, you will have a unique opportunity to be a pioneer in the newest Peace Corps program in the world. Such opportunities are rare indeed and require the best each of us has to offer. The last PCVs left Nepal in 2004. the last group was N-128. The usual explanation for closing was concern about the volunteers? safety during the insurgency. Today, many ex-volunteers and concerned Nepalese want to see the Peace Corps return to Nepal. One of the organizations supporting this goal is ?Friends of Nepal?. What?s new? Shan State has long been a centre of conflict and illicit drug production ? initially heroin, then methamphetamine tablets. Good infrastructure, proximity to precursor supplies from China and safe haven provided by pro-government militias and in rebel-held enclaves have also made it a major global source of high purity crystal meth. Myanmar?s Shan State has emerged as one of the largest global centres for the production of crystal methamphetamine (?ice?). Large quantities of the drug, with a street value of tens of billions of dollars, are seized each year in Myanmar, neighbouring countries and across the Asia-Pacific. Production takes place in safe havens in Shan State held by militias and other paramilitary units allied with the Myanmar military, as well as in enclaves controlled by non-state armed groups. The Nepalese Civil War known popularly as the Maoist Conflict (Nepali: माओवादी जनयुद्ध; IAST:māovādī janayuddha) or Maoist Insurgency or Maoist Revolution was a ten year long armed conflict between the Communist Party of Nepal (Maoist) (CPN-M) and the government of Nepal, fought from 1996 to 2006. The insurgency period was popularly known as Maovadi Dwandakaal (Nepali: द्वन्दकाल) in Nepal.